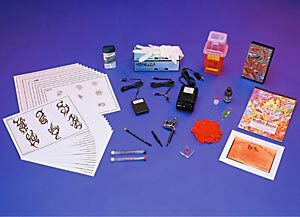 COD is NOT available for tattooing kits or outfits. Please do not choose COD as your payment method when checking out. Additional shipping charges may apply to your kit purchase. * Please check the green section of our Shipping Table. Thank you for understanding. *Additional Shipping charges above the standard price-based shipping rates are required on all of our kits. This is our new VooDoo Tribal tattoo kit. This outfit comes with our new compact DC power supply. This unit supplies clean power to run any of our machines. The machine is a Reaper Quick Change machine featuring 1”, 10 wrap coils, silver contact screw, 10 MFD 35 volt capacitor, nickel-plated machine springs with contact point and O-ring on a rubber nippled armature bar, our patented (#D356,944) LeeverLoc Fastener Device and a Lexan disposable tube. The frame is a chrome-plated investment casting with stainless steel hardware. Along with the instructional video The Art of Tattooing, you will be on your way to becoming a tattoo artist.